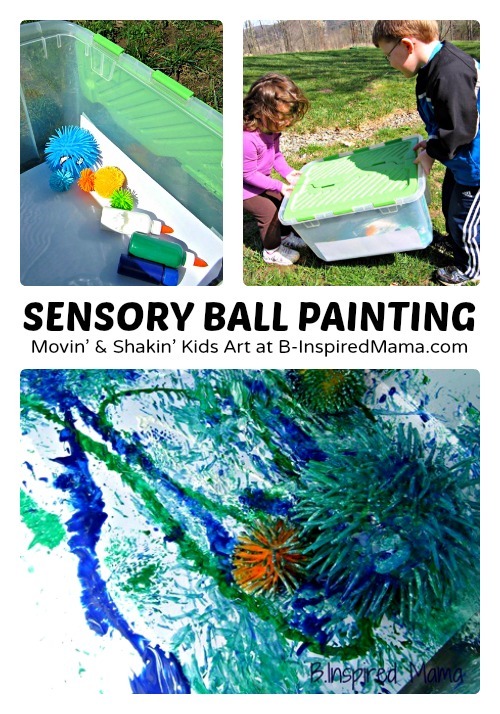 A Movin’ & Shakin’ Kids Painting Technique! 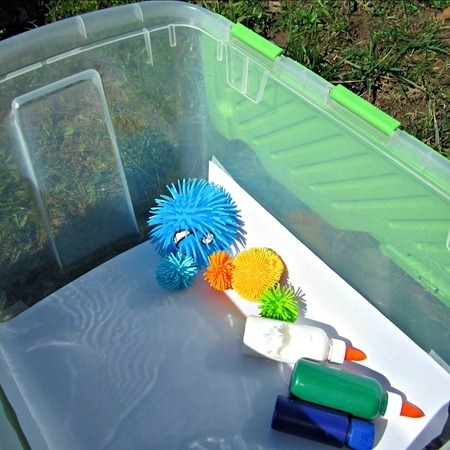 First, we taped some paper into the bottom of a big plastic storage tote and took it with the balls and paint outside. 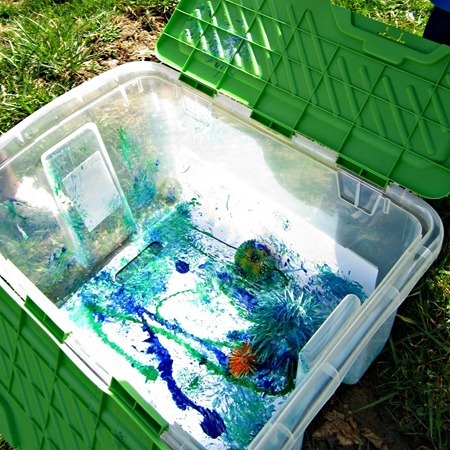 Then we squirted some paint (blue, green, and white) onto the paper and threw the balls inside. Then we shut the lid, each kid grabbed an end, and they shook, shook, SHOOK! Giggling the entire time of course. Then we ooooh’ed and aaahhhh’ed when we opened the lid to see this AWESOME textured painting. I think I love these silly rubbery sensory balls now! My kids have those balls. Every time they go out with Grandma and Grandpa they seem to come back with them. I don't like them either. They always seem dirty and then they start to slowly leak and get even grosser! I'm so glad I have a fun use for them now. yeah! What a great activity I love it – and I HATE with a passion those balls… we currently have a large soccer ball that I wish would disappear. I know just what you mean, this is a great use for them. Do please join me on Country Kids too as this looks like a great outdoor activity! So much fun!!! 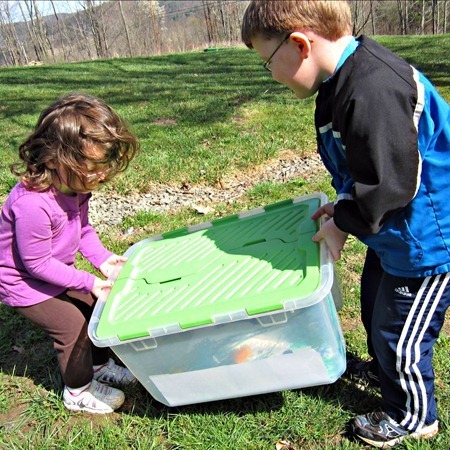 Then they can fill up the bin with water and see the colors mix while they do clean-up. Brilliant! YES! They watched me use the hose to clean it out and it make a nice sea of blue green. But two primary colors would have been great as a color mixing experiment! This is really cool!! It looks like a whole lot of FUN!!! Thanks, Christine. It really was! What a great idea!! My kids get these every time they go to the dentist so we have a nice little collection 🙂 Thanks for the great idea!! I think this looks like sooo much fun! Even our big kids would love it 🙂 What a great idea! Beats the store bought spin art in my book! I've been wanting to do some spin art! But this was more fun probably. Especially since it was outside and they could get their whole bodies into it!